Both trips to Greenland this summer returned having achieved "full on" trips. The first up into the top of Sermilik fjord, through very thick pack ice. The second trip, as planned, paddled up into Tugtilik ( Lake Fjord ) where Gino Watkins died in 1932. 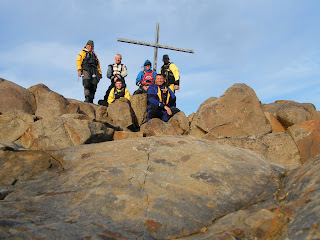 We again found his memorial cross and explored the remains of his base camp. Ice conditions produced some fantastic paddling and we saw several whales and many more seals than usual - the elusive polar bear was not seen, although six were reported in our area while we were there and one was shot by local hunters at a hut two days before we paddled in to stay. Bookings are being taken for next year and 2011 with one trip in 2010 already fully booked. If you require details please contact me as soon as possible. Paddling trips in Shetland is now back to normal,to catch the end of our summer, which has been good while we were away.